There are close to 30 Community Gardens located in Washington, DC. A handful of the gardens are located in S.E. 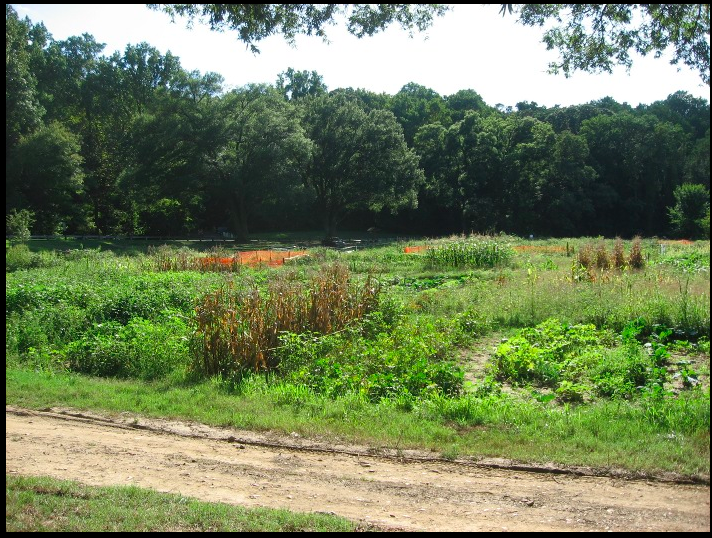 The gardens range in size, the smallest of the gardens has about .025 acres of land and is located in a small church parking lot, while the largest garden located in Fort Dupont Park has about 3.5 acres of land. The rules and regulations of each garden vary depending on its location and community participation. For example, The SEED Community Garden located on 18th & E Street S.E has a President, two required annual workdays for the gardeners, it requires gardeners to submit working hours, and the gardeners are required to use organic gardening methods. Unlike many of the community gardens in DC, The SEED community garden does not require gardeners to pay an initial or annual fee. The closet community garden to my family happens to be The Fort Dupont Garden. Fort Dupont is an old Civil War Fort and has been preserved by National PArk Services. We are currently being assigned a plot for the spring of 2013. We have been waitlisted for 2 years. Through my small research I have found that Community Gardens located on land owned by the National Park Services (NPS) are “convenient” for the people who support the idea of community gardens, but who are not financially stable to maintain a garden, and don’t actually have the time to commit or are uneducated about the gardening process. Because the gardens are located on the land of NPS it is their responsibility to maintain the actual garden, and because the land is owned by NPS they are unable to charge the community annual fees to support the garden. Gardens ran by NPS can only require participants to live in the DC area, they are not allowed to excluded non community members. I believe this is a major issue. The DC are includes, Washington, Maryland, and Virginia. I can only assume that the gardeners from Maryland and Virginia are not feeding the residents of DC. DC's Park and Recreation is another government ran organization that has community garden space. They are allowed to charge annual fees and they are able to restrict garden use to only members of the community. They are able to do this because each ward has at least 2 recreational centers, and the gardens are located near the centers. LoveJoy gardeners are required to pay a key fee because the garden is protected by a gate. 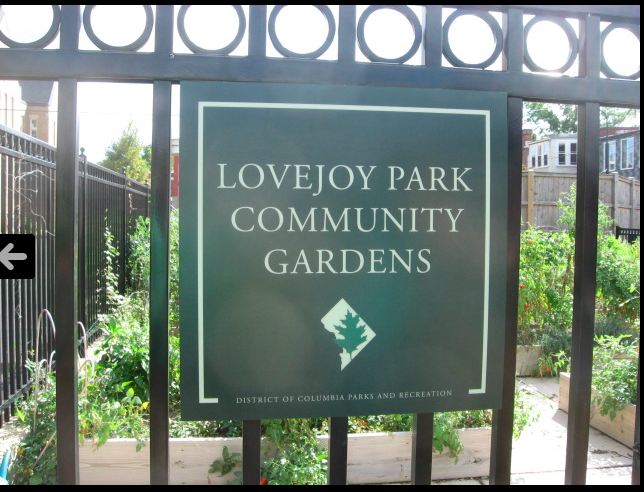 LoveJoy Garden is a wonderful example of an urban- community garden. It is located on a paved plot of land with several manmade garden plots. · Engage participants and volunteers in outreach and educational opportunities throughout the year. I have found DC’s Field to Farm Network to be the most up to date, and updated DC community garden blog in DC. It connects every small urban farming organization in Washington, DC. On this one site you can find links and information from Arcadia to the Washington Youth Garden. In the Laura DeLind reading for this week, “Place, Work, and Civic Agriculture: Common Fields for Cultivation”. Delind discuss the many ideas of Civic Agriculture. She believes civic agriculture should be used as a tool to connect the community, not only as a source of food. Using her definition I want to rule out the location aspect of a community garden. If the garden is located within your community but member outside of your immediate community controls it, it is not supporting the growth of your community. A community cannot support people passing by. For example, my family has been waitlisted for our community garden, however there are currently plot holder who do not even live in DC using the land. This example alone takes away from the idea of community gardens. The non- Washingtonians are not supporting the community they are just using the land. And if they are using land located on land owned by NPS, they are using the land for FREE. Depending on how you define community gardens all of the included examples can be viewed as community gardens. DC Native. Anthropology Major. Addicted to Social Science.